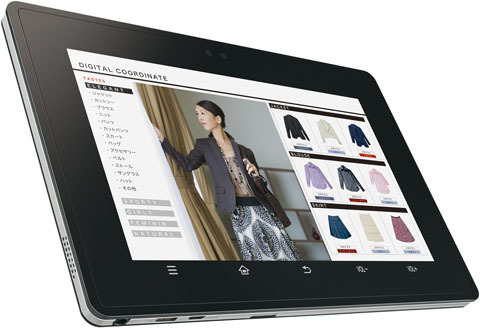 The folks over at Sharp have announced a new NFC enabled tablet headed for Japan. This will be a 7″ Android tablet but initial reports are claiming we will only have Android 2.3 Gingerbread on board here, no Honeycomb for now. A big part of the release is the full support for NFC interaction with support for Japanese FeliCa cards at the start, but we can expect additional cards in the near future. At first thought this appears to be the first NFC enabled tablet to the market. While I like the idea of having a tablet with the option for NFC it doesn’t seem all that practical if you ask me. It will come to market in the small 7″ form factor making it more portable, but if you are carrying it most likely the chances are you also have an Android smartphone somewhere on you that has the same NFC capabilities. Packing a tablet into a store just doesn’t make much sense but who am I to say what is practical right? Last we heard from Sharp they were prepping a 7″ Android 3.2 Galapagos tablet so why they’d choose to run with Gingerbread on this next tablet beats me. The NFC capabilities are all nicely there on Gingerbread so that could be the cause. So far the details regarding the RW-T107 and the rest of its hardware are still lacking so we will report back when we can. It is currently being prepped for a Japan only launch around September 5th, hopefully we hear about what is under the hood shortly.